Tank Slappers, steering wobbles, shimmy, speed wobble, and even death wobble are all names of the same dangerous situation that can happen to any motorcycle rider, especially for all the sportsbike fanatics. That is not at all a nice feeling when out of nowhere your bike starts wobbling like a maniac and there is very little that you could do. 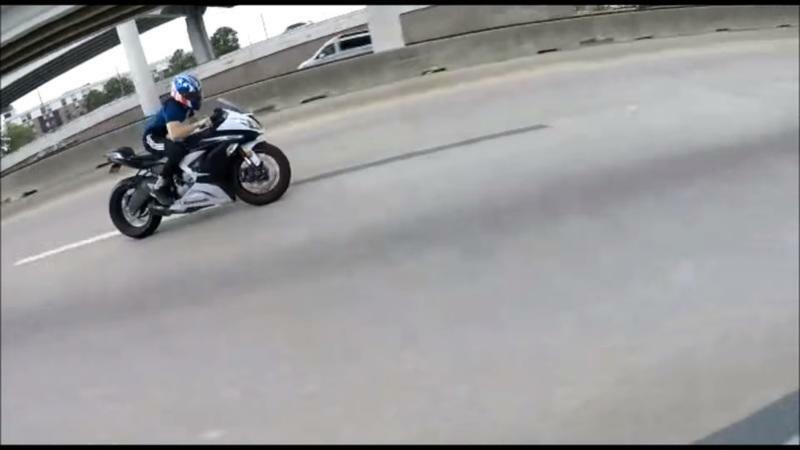 That is exactly what happened to this bloke here who was caught on a GoPro footage taken by fellow motorcyclists while they were doing a high-speed freeway run. At 130 mph, his Ninja ZX-6R started wobbling heavily leaving the rider with no control of the bike for several hundred meters before the bike slowed back down and the rider gained control. For someone who is nicknamed ’Maddo’, this Australian stunt rider sure carries a million mad feats under his cap. He has already won numerous international FMX events around the world and has been recognized as one of the best FMX riders of all time. He also holds multiple motorbike stunt records and has acted in several action flicks as the motorcycle stuntman. 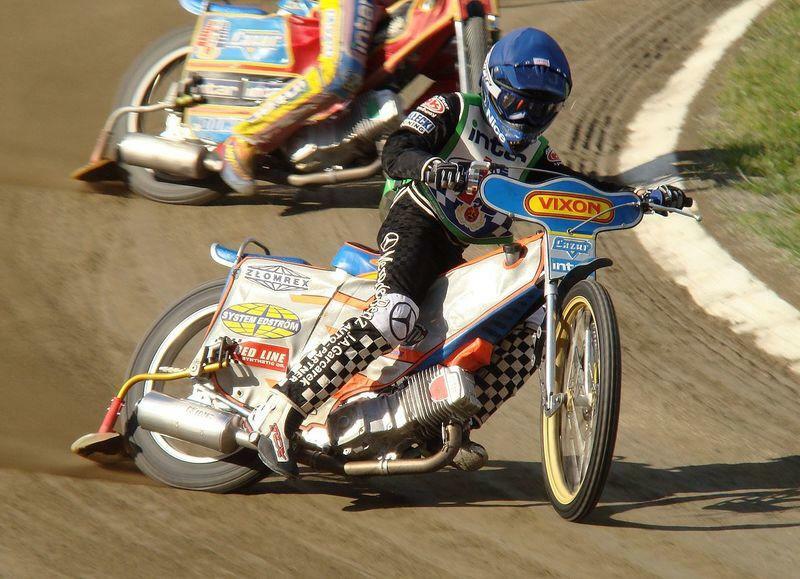 Now, Robert William ’Robbie’ Maddison has set his eyes on creating another record. 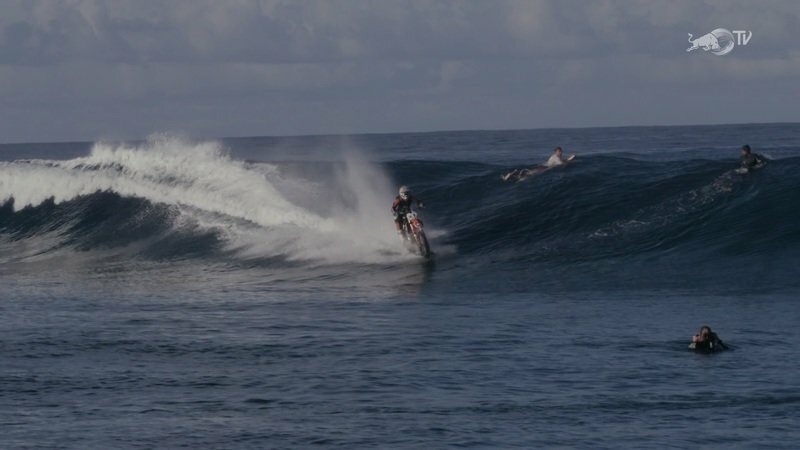 He wants to become the first ever to surf an ocean wave on a motorcycle. And not just any wave, but one of the heaviest waves in the earth in Tahiti, a small island in the South Pacific. Yes, you read that right. Riding a motorcycle through a wave, just like a surfer. Being a stuntman on land is itself a very tedious practice, and Robbie wants to now surf the wave on a motorcycle? That’s just bonkers. Check out the skill Robbie has learned guys. Robbie just broke boundaries. 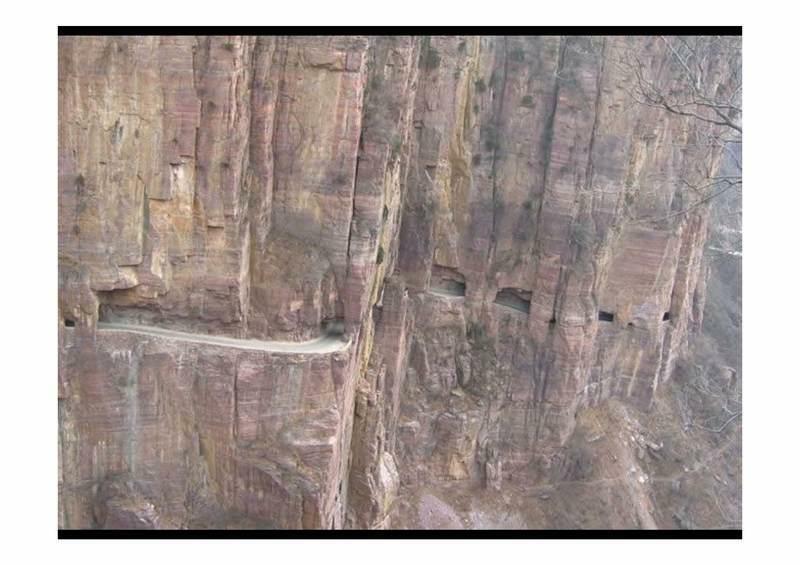 Roads in India are notorious. Jaywalkers, stray animals, vehicles coming from the wrong direction is all the norm there and people have even learned to just live with it. Law officers cannot help much even, considering the number of people and vehicles that ply on the roads. 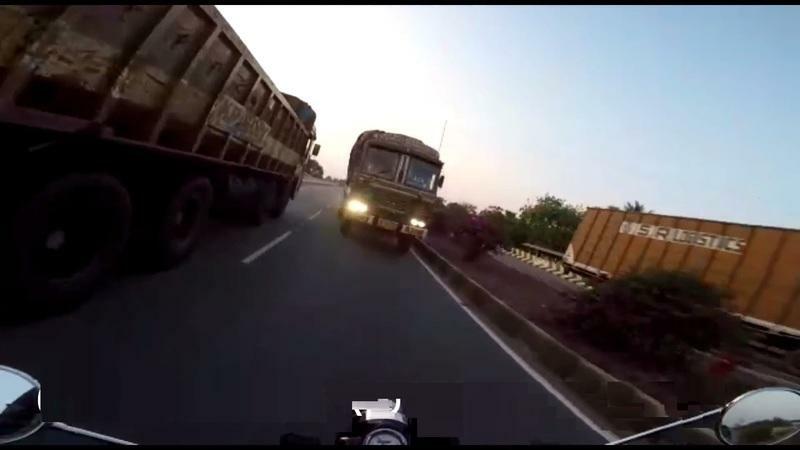 There is an accident always bound to happen on Indian roads, and this is one such incident that was caught by a GoPro action camera mounted on the helmet of a Royal Enfield rider. We all want to jump off a ramp and feel weightless with our bike. Doing that may sound dead easy, but it involves a lot of things in play. Ramp angle, approach speed, bike weight, fuel mass, rider mass, and some basic mathematical solutions to land you safe back on the ground. This guy here on a Harley thought he could pull off a Travis Pastrana jump. He did get a few things right though: two ramps, a bike and himself. Unfortunately, he must have left his brains hanging in the backyard and forgot to pack it. Everyone has their good days and bad ones. Being at the right place at the right time can sometimes do wonders and change a person’s life for good. But this guy right here had all his stars aligned that day, and probably nothing could go wrong for him. Not even when his bike wobbled out of nowhere, and he lost control of his motorcycle, went on to crash and go under an articulated trailer truck. Stories of bike thefts in the UK have reached surprising levels. Impudent British brats in Bristol uploaded a video on their handle on the social media platform, Instagram, where they are seen lighting a vintage Triumph Thunderbird on fire only because the owner of the bike refused to pay them a ransom of £1000 ($1,400). 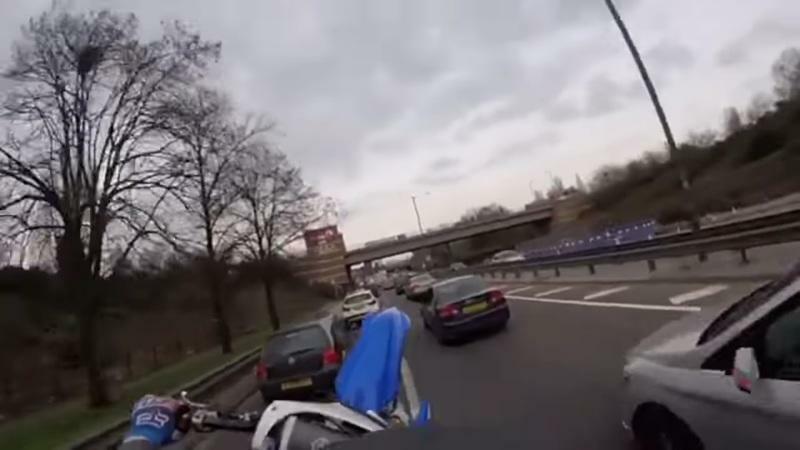 This video in discussion had been posted on the closed-group Instagram account “biketakerrr”, which have now been removed after it created sparks for being violent in nature. Luckily, we did get access to a couple of snapshot images taken from the Instagram account. A professional motocross racer, 17-time X Games winner, world record distant jumper, and the list goes on. 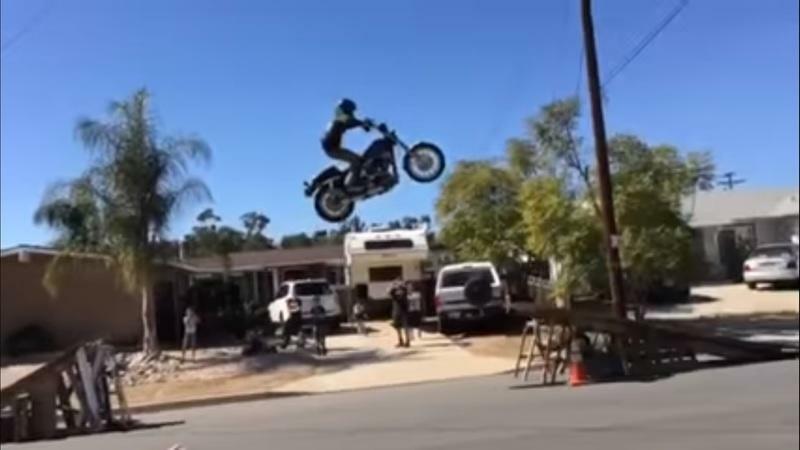 Having so many tags behind his name, Travis Pastrana is undoubtedly the crazies daredevil there is out there. He has already had 32 surgeries and is still earning to get onto his bike every single time. Jay Leno, the host of "The Tonight Show" back in his days, had the 15-year-old Travis on his show just when the stuntman had turned Pro. Now, after a decade, both meet at Travis’s own show: The Nitro Circus. Leno is going to participate in one of the crazy stunts happening at the Nitro Circus and it is a huge deal. 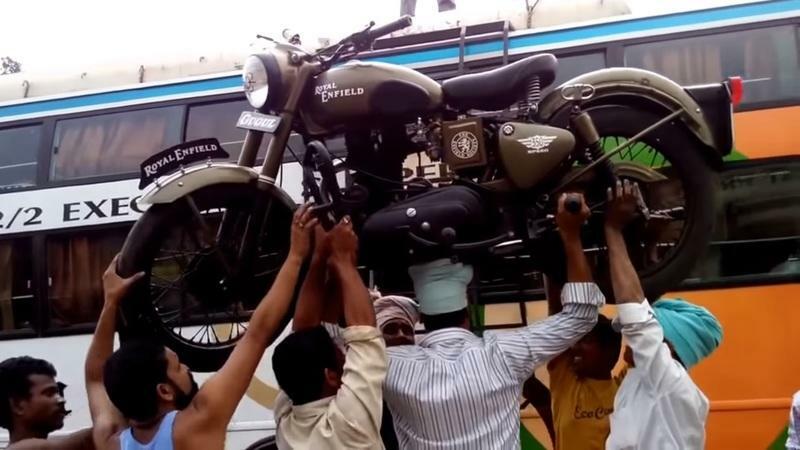 Loading a Royal Enfield onto a bus, carrying it on the head! Thinking of it makes me stretch my neck. An average human being will struggle to lift 100 lbs over his head. But folks in India are used to lifting heavy pots filled with water over their head for centuries. Even today, you will find vendors selling fruits, toys and all kinds of stuff from a basket over their head. Balancing anything on your head is no easy task. When you make that thing a motorcycle, and you scale a ladder as you do it, you enter the realms of the superhuman. You are blazing through the bends of a hill, leaning away in glory across all the sweeps and turns. But at one blind corner, you see a huge truck approaching in the opposite lane, and all red flashes in your brain. It subconsciously tells you to turn the handlebar right to steer right, and when you do that, the bike swings right back to the left, and you go crash the truck. Unfortunate, but this is exactly what happened to a bloke running a mountain course. Whose fault was it? The blind-spot? The speed? The rider? Well... it is all of the above. Every rider must know to slow down at a blind spot. You never can predict whats on the other side. Nonetheless, there is a sneaky little trick that if the rider had known, could have avoided the crash. And that is Counter-Steering and a bit of going against your intuition. NOTE: We do not endorse/promote stunt riding on public roads. Keep yourself and other road users safe. Always consider safety first and wear a helmet and all riding gear. Getting stuck in traffic. We are always in shock and denial, and even though we knew it was coming, we always find ourselves amazed at the hour-long standstill line. Then there is this guy who beats it on his two-wheels. And he just doesn’t ride it through small spaces but does it in his own style.. pops a wheelie. Off-road riders on public trails in New Hampshire, Idaho and Massachusetts have been finding a variety of booby-traps, to include “rattlesnakes” (boards with nails in them), broken glass, loose nails and cables strung across the path. 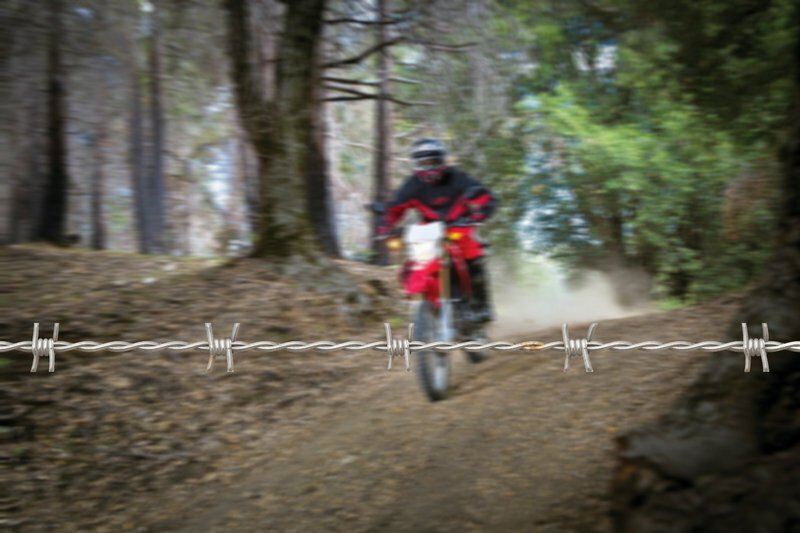 The most egregious instance (so far) involves a piece of barbed wire strung across the path right about four-feet high, just the right height to catch on a full-size dirtbike or possibly decapitate a younger rider or someone on a four-wheeler. The American Motorcyclist Association has issued a warning for trail riders in these areas, but this is just the latest incident; areas in the Four Corners have also been found to have similar traps scattered about in recent years. I think it is safe to say that all off-road riders should exercise greater-than-usual caution when riding, and to be on the lookout for any suspicious-looking characters or activity in such areas. Continue reading for my take on this atrocity. The name Jorian Ponomareff may not be all that familiar to some. In fact, we’ve never heard of him before this video, but his amazing drifting skills have made him quite a sensation and we decided it was time to learn a little something about him. Jorian Ponomareff started his motorcycle training when he was 14 years old and got his first two-wheeler. Since then, he has become one of the best stunt drivers in the world. He became so good that he is now traveling all over the world performing his skills in shows that can only be described as amazing. After years of training and no doubt, thousands of falls, one can perfect a skill and Ponomareff’s dedication to the craft has made him an impressive stunt driver and entertainer. Enjoy the video! What in the world, right? It’s supposed to be a tricycle of sorts, only that it’s got a Hemi for an engine, it can do sick burnouts, and it comes in a gargantuan design that defies any form of coherent descriptions. 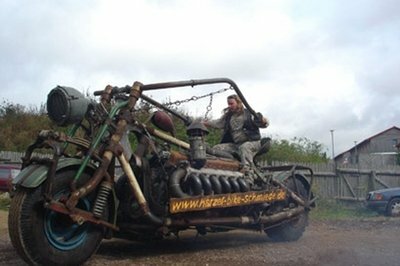 And while we’re at a loss as to how to come up with adjectives to describe this monstrosity, it’s owner, Tim Cotterill - he calls his baby the ’Rocket II’, for obvious reasons - is just all too happy to take this bad boy out for a ride. At this point, whatever word that comes out of our mouths is pretty much irrelevant by now because there’s really no describing this piece of work. So, we’ll just let the video do the talking for us. Watch and enjoy! 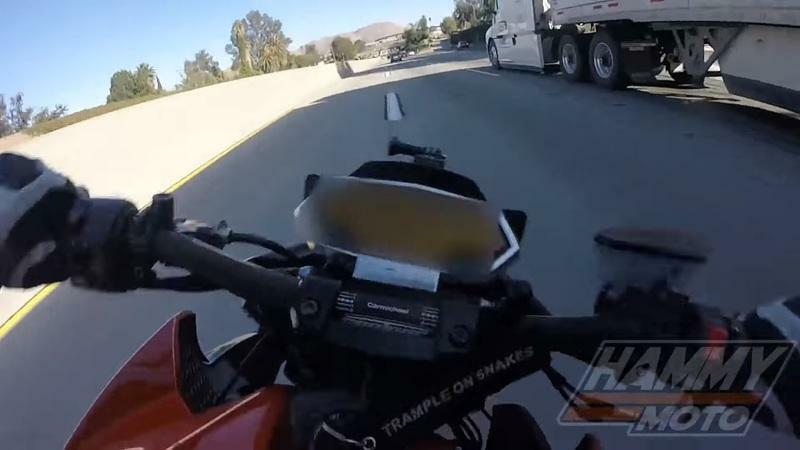 See what happens when a Honda National Motos pit crew member unintentionally drops gasoline all over a Honda CBR1000RR right after refueling. The bike had participated to the race up until that point, so the red hot exhaust acted as a spark, igniting the racing motorcycle just as the team members were trying to clean it up. 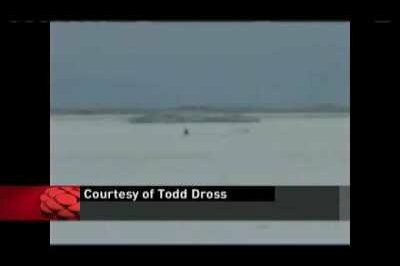 Last month at the Bonneville Salt Flats in Utah, Jason McVicar of Vancouver experienced a crash from the Suzuki Hayabusa 1300 as he was establishing the speed record for the fastest production motorcycle ever: 391 km/h. What makes the story even more amazing is the fast that it survived the crush without serious injury. 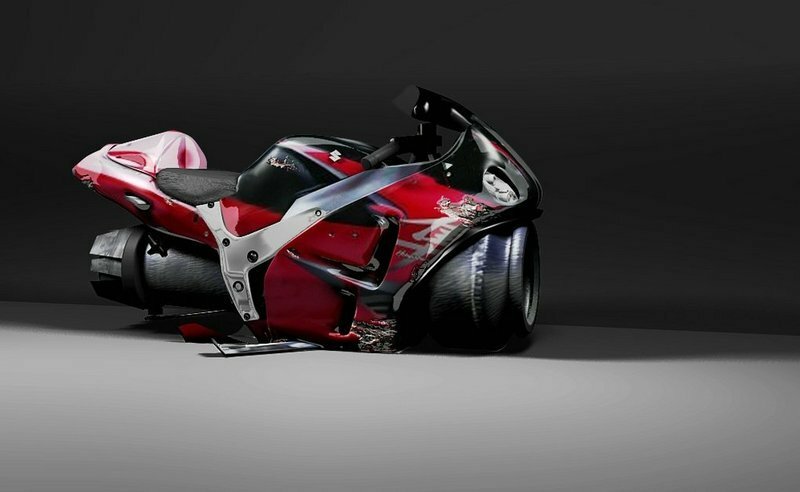 We can’t say the same thing about its bike though as it was bended, disintegrated and burned as a result of the amazingly fast accident. Criss Angel dissapearing with a dirt bike! In the second season of Mindfreak, Criss Angel does a little spinning on a dirt bike in the desert and vanishes in the dust. Hey, bring that bike back! During the years, we’ve kept you informed on everything that was new, outrageous and about everything that broke the rules and now we’ve come across this video which, through its slides, brings those bikes back to your memory and others more. So enjoy! Usually, the stunts that we post have only happy endings and often break a world record, but this is no usual stuff! In this video which shows a stunt attempt the bike’s wheels miss the ramp, but the rider doesn’t and he slides all the way to its top. Motorcycle video of the day: IMZ Ural - commercial video? 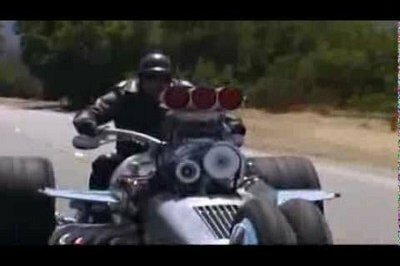 Who unleashed the "Monster Motorbike from Hell"? Have you ever imagined a motorcycle on steroids? I mean, thirty feet (9 metres) long, ten feet (3 metres) high and weighing as much as a school bus kind of a motorcycle beast? Yes, that’s the beast from the photo above. 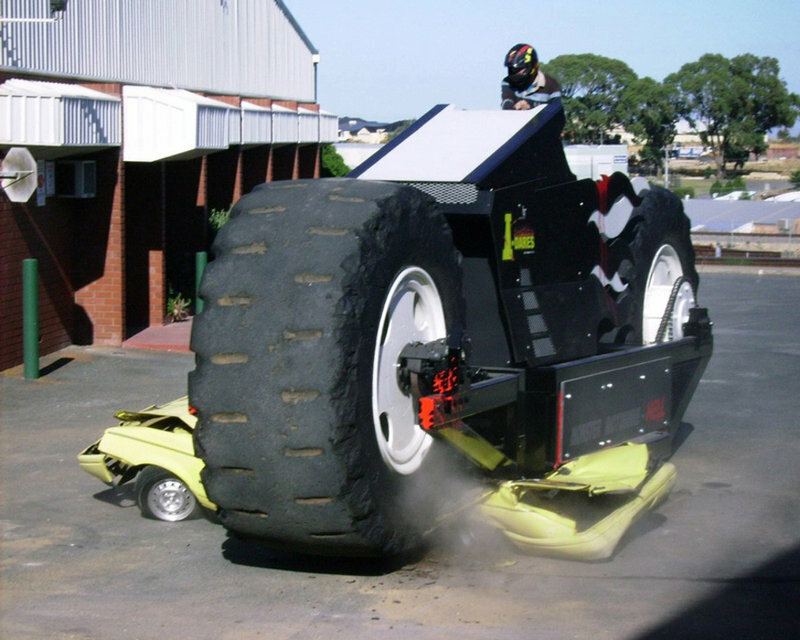 It’s a 13 ton/ 28 660 pound two-wheeler designed and built in Perth, Australia, by the stunt driver Ray Baumann which has spent the last 3 years developing what appears to be a world first. 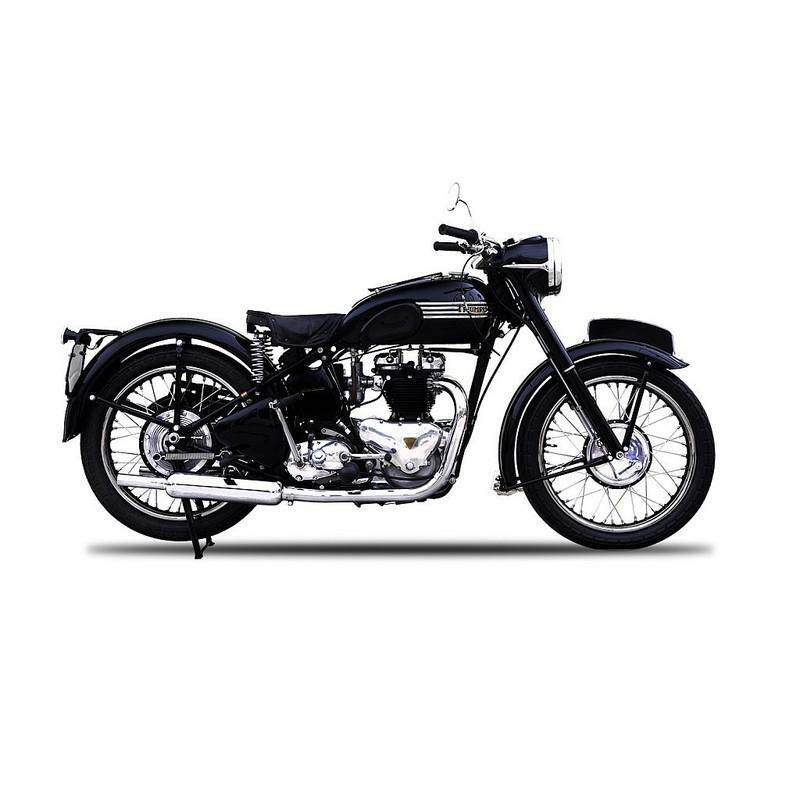 Motorcycle builders always try to keep their bike’s weight as low as possible in order to best value the engine’s power and prove efficient and great performing. But sometimes people feel like breaking the rules and I can’t find a better example than "the Led Zeppelin". Last week I presented to you a brand new motorcycle concept which was created by a very inspired artist with a lot of imagination after countless hours in front of the computer. The entire design and idea were new to the rider’s eyes, very different of the bike that I have the pleasure to present to you today. I promise that I won’t complain anymore about our lousy, traffic-congested superhighways. Why?